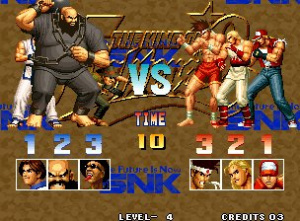 After having some solid success in arcades with the inaugural game in the series The King of Fighters '94, SNK wanted to try to address some of the complaints players had with the game in the sequel. Two of the biggest complaints were the inability to customise your own team lineups and the inherent lack of challenge with the CPU-controlled opponents in the first release. 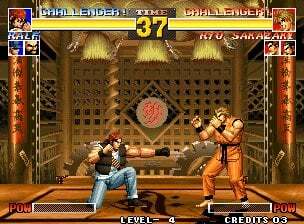 But while SNK were able to successfully give players the team customisation options they were looking for in The King of Fighters '95, they also managed to go quite a bit overboard on upping the difficulty and challenge of the CPU opponents, thus making the game extremely cheap at times and ultimately defeating most of the other improvements made to the sequel. 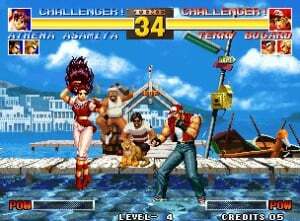 The fighting engine itself hasn't changed much since The King of Fighters '94, but the game does now allow players to choose their own individual team members from the entire cast of characters, rather than have the three-fighter teams already assembled. You still have your weak punch and kick attacks along with your strong punch and kicks, and of course the POWER gauge is back, something that allows you to execute your character's Super Special Move or Guard Cancel for a much more devastating attack. There are several different game modes to choose from. Single Play allows you to choose a character and duke it out with the leader of each of the respective teams. Team Play lets you choose your three-character team and go up against the CPU's own team of fighters. You can even go so far as to take on the Single All mode where you can choose only one fighter and take on the entire game's cast of characters, one right after another. Each mode has their own pluses and minuses, but the Team Play is generally the best way to play the game as a single-player experience, especially given the game's high difficulty level. If you're looking for some competitive action, there are a few modes to choose from here as well. You can take on the Single Vs. mode that allows you and another player to each pit one character against one another. Or if you prefer the more standard mode of the King of Fighters series, you can play the game's Team Vs. mode where you each choose your team of three fighters and play until one player has bested all three characters on a team. Much like the single-player version of this mode, it's easily the most enjoyable and competitive way to tackle the game. As with most games in the series, the control is extremely responsive and the special moves are fairly easy to execute, even in a pinch. The real problem comes into play with the CPU-controlled opponents more than anything. In an effort to crank up the challenge a bit, SNK seems to have gone a bit overboard with their AI. Not only is it brutally challenging, even on the standard setting, but it tends to be very cheap as well. Often your fighter won't even be able to hit the ground after an attack before the CPU opponent pummels you again. Even veteran fighting game fans will likely have trouble beating the game and it's definitely something to consider before you think about picking up the game. From a visual standpoint, you're not going to see a lot of dramatic improvements, although there are certainly plenty of new backdrops to enjoy throughout the game. The same can pretty much be said of the musical presentation and it never diverts very far from that of the original release. Even the announcer's voice didn't get much of an improvement in this somewhat lacklustre sequel. Although there are some welcome improvements in The King of Fighters '95, the overall package is probably not significant enough to warrant buying the game for those who already own the previous instalment. And given the brutal and sometimes quite cheap AI of the game, gamers not quite as seasoned in the fighting game genre might want to think twice as well. The King of Fighters '95 is still a solid release, and will test even the most skilled fighting game fan, but those looking for a more serious step up in the series might want to hold off for King of Fighters '96. I've never been a big fan of King of Fighters. I just discovered it last year, actually, since I've only ever played Nintendo consoles until a few years ago. The challenge in this doesn't sound like one I'll be trying to overcome. 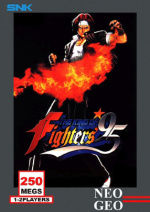 95 is actually my favourite King of Fighters. Might be down to nostgia of the Saturn version but it's definately up there with the best fighting games of that era. Infact I wouldn't say hold off until KoF 96 - I think that's a slightly poorer title. I'd say hold off until 98 if you want some great improvements. I'm a fan of the series but surely a much better option would be to buy the King of Fighters collection that gives you access to the vastly superior sequels, especially King of fighters 98. I've always enjoyed KoF96 the most. I don't see how its poorer than KOF95. However, 6/10 does seem kinda low for KoF95 especially when the original Fatal Fury scored a 7/10. KoF95 is easily better than Fatal Fury. But then I'd say Fatal Fury was over-rated at 7/10 for what it is. Well 95 is just better than 96 in my oppinion. I just say that for nostalgia reasons, prefer the stages, the music etc. Technically I have no idea - they're both fun to play. And yeah 98 will be a bit of a wait if you want it on VC but there's always the King of Fighters collection if you want it now. that's the thing i hated about the KOF series, they have insane AI, after the first 2 matches. and all of the bosses have " Snk Syndrome ", Its a real term SNK made up for this game in particular. Its when the boss randomly jumps in terms of AI and difficulty, from being beatable to being unbeatable in a blink of a eye. Well, i know here i have a lot of friends who play it at the arcade, and they're always having a good time. I never heard of the series until i got to japan. My friend says the "real" fun with the series didn't start until '98, but im unbiased as i've only watched. I guess the only one i've been was XII(? ), since its out in japan now. Looking at sites for the japanese VC, it seems like unless they release next next few games out in japan on the VC in succession, '98, let alone newer ones, will probably never get on the Wii VC. I still think '99 is the best of the series, but it's so large in cart size, it's not likely to show up on the VC. At least not this generation. In truth, although I own every KOF game available on the Neo arcade cabinet, but the only ones I play with any regularity are '99 and 2002. I only played the 94 version of King of Fighters but it didnt really get me into the series as for KOF 95 i wouldnt be getting it. For a bit of a change, maybe, JumpMad? Because Tatsunoko vs. Capcom is an over-powered button masher at heart? Why not try a proper one-on-one fighting game in its purity. There's more to fighting games than T vs. C.
Why wait for 96 when all of them are already available at retail for cheaper the value? I have to disagree with this review a bit, I own KOF 94' and 95' (on the Neo-Geo itself no less) and I've found that 95' is much easier than 94' in all aspects. @jumpmad. Because they aren't the same game in any way but the genre? Won't be getting this one. &udging by the review, it seems to embody everything I hate about fighting games. I love KOF '95, and IMO it's much better than '94, but it is really hard. I've yet to get past the 3rd match out of 10. Excellent game and the super turbo of King of Fighters for its time. Has proper 2 in 1's and excellent combo opportunities. Very good soundtrack especially in this case the chip set one. When this came out everyone was playing this, super turbo and mortal kombat 2 in the arcades. That was a good choice to have. Only problem I have with the game is the damage protection is too low. I was EXTREMELY lucky to find the King Of Fighters Collection and Samurai Showdown Collection for five bloody euro's each! KoF Collection is where its at. screw VC. Also, KoF 95 is the worst one, IMO. I did not like it at all. 96 is much better. So yeah, has anybody mentioned yet that this version of the game is censored? Mai's breasts don't bounce, not even in the win animation. And it was mildly irksome that I had to adjust settings for the game to show up properly on my HDTV with component cables without flickering like crazy. I didn't have to do that with any other VC game in my library. 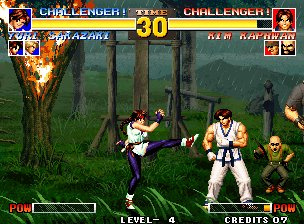 I would personally skip King of Fighters 94 in favour of KOF 95 unless you have a favourite charachter in KOF 94 or something. '94 actually had quite a bit higher difficulty in comparison to this. Honestly, the Ai in this isn't as cheap as most mid-90s SNK titles. there are plenty of small changes that overall makes the game much more enjoyable. I think King of Fighter 98 is the definitive version, I do hope that will come on VC soon.